An angel bird feeder is a lovely way to decorate your outdoor haven from the heavens above. We have received requests as to where to find such angelic type bird feeders so here is what we have found. 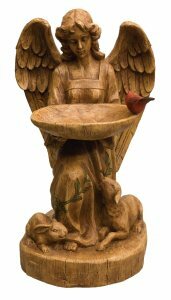 You can get an angel bird feeder made from all different kind of materials including cast iron, stone, resin/stone blend, embossed metal, stained glass and more. Just make sure it is for outdoor use and sturdy and will not rust or deteriorate from weather elements. Think about how it will hold bird seed. Does it hold enough seed for your bird traffic? Will it retain a lot of water when it rains? Is it easy enough to clean out the receptacle when needed? Or you can simply make your decision on what design appeals to you most. If you can find one where design and functionality both appeal to you, then you must be living right. Here are Angel Bird Feeders on Amazon. They range in price from around $30 to as much as almost $900! What is so special about the $900 bird feeder? I do not know, apparently it is very well made. It looks like hand-carved wood, but actually is made from a durable stone/resin blend. Hope you find that perfect angel for your backyard bird visitors. I know both you and your feathered friends will both enjoy the addition to your wildlife haven from heaven. As one of the bird feeders reads: "Today's dreams are the seeds of tomorrow's happiness." Other Wild Bird Feeders - Tube, Platform, Window, Squirrel Proof, Hummingbird feeders and more. Wild Bird Food - What do Birds Prefer? Which wild bird seed to use in order to attract the species you desire to your bird feeder. Precautions against Bird Diseases -Protect birds against Salmonellosis, Aspergillus fungus, Avian Pox and others.